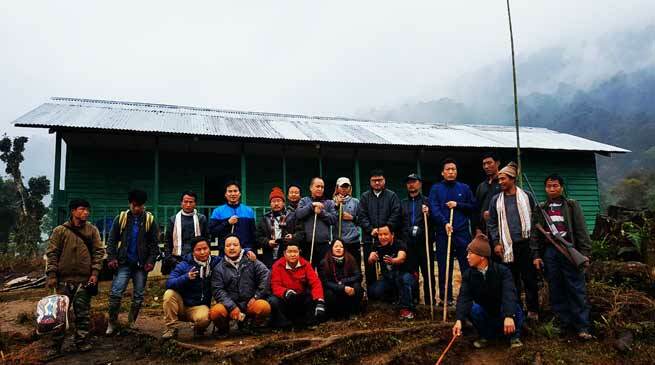 A team of Officials of Kurung Kumey district toured on foot to last village of India along the international border in Arunachal Pradesh as part of a public outreach programme under “Sankalp se Siddhi Tak – “New India Manthan”. As Deputy Commissioner Kanki Darang said, The purpose of this tour was to take stock of various development activities being carried out in those areas. He also distributed blankets and warm clothing to senior citizens residing in the village in what can be considered as one of the most arduous and demanding tours undertaken by any high ranking district official of Kurung Kumey district since the establishment of administrative centre in 1959 in the district. DC, Kanki Darang undertook the tour on foot accompanied by AE(RWD) Toko Talam, AE(Power) Bengia Kagung, PO(APEDA) Talo Nguri, DlO Bamang Apo, Medical supdt (CTMDH) Dr Boni Taluk, BEO Bamang Tach, DRRO i/c Toku Natung, JE (PHED) Yumlam Tajum, BM (APCAB) Kipa Kaman to Palo, Polosang, Machane, Mili, Gaane and Sape to some of the most remote villages in Kurung Kumey District under Sarli and Polosang circles starting from 13th Dec to 17th Dec.
Darang said that Mili village is the last village along the route of Mukhpla Pass and lies at 2nd Control Point. Gaane is the last village lying along the route of Jammu Pass and lies at 3rd Control Point at the international border. He assured the villagers of Mill and Gaane to Provide safe drinking water, electricity and solar lighting to the households. He interacted with the villagers and discussed about the expectations and delivery of development activities in the area. He also stressed on the importance of agricultural and horticultural activities which needed to be taken up in the area for self reliance. The entourage led by Deputy Commissioner was greeted with much excitement, enthusiasm and appreciated by the villagers, GBs and PRI members.